The Festival de Música de Canarias has been an annual event since 1985 and was inaugurated to enhance the culture of the islands and to promote them as more than just a "sun and sea" destination for holidaymakers. Spanning the months of January and February, the main programme of concerts is divided between Tenerife and neighbouring island, Gran Canaria, where there will be a total of 19 on each one. There will be a smaller series of four concerts on each of the other five islands. Beginning on January 10th, the first concert in Tenerife is on the 12th, at the iconic Auditorio in Santa Cruz. Most of the subsequent concerts are at this venue too, but there will be a couple at the Magma Arts and Congress building in Adeje, plus one at Teatro Leal, in La Laguna. Tickets may be purchased from the Tenerife Auditorium or the bank Caja Canarias. I suppose this is the closest Tenerife will get to a pantomime! This month, there is to be a musical version of the famous children's story performed at the Teatro Guimerá in Santa Cruz. With almost no spoken or sung dialogue, the presentation of the tale relies mostly on dance and computer imagery. A collaboration between Roseland Musical Theatre Dance Company and the multimedia production company, Uranus, the production combines the traditional aspect of the former with the futuristic possibilites of the latter. The result is an extravaganza of modern dance and acrobatics, paired with virtual, computer generated sets, including the groundbreaking feature of "motion capture", which is three dimensional character creation. All in all, it should be a superb show, for all the family. It runs from the 3rd to the 8th of January and tickets cost between 8 and 12 euros. 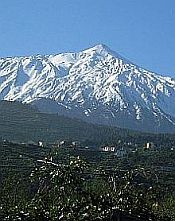 In 2011, our one visit to Tenerife was later than usual, taking place at the end of November and running into December. It was the first time in ages that we'd been on the island during what passes as its winter. This section of the newsletter is to provide information to those of you who are wondering what the temperature and weather is going to be like during the winter months. Rest assured, during the day, you will still enjoy hot temperatures (though not as sweltering as in summer). There's a chance of cloud, just as at any time of year and even a slight possibility of rain. All in all, though, it's not that much different than summer and may actually not be as oppressively uncomfortable. It is in the winter evenings that you'll notice the drop in temperature. Once the sun goes down, it can get a little chilly and, if you're planning on holidaying during these months, it's best to take a sweater or cardigan. It's still much more agreeable than the UK at that time of year!